Maximilian I (22 March 1459 – 12 January 1519) was King of the Romans (also known as King of the Germans) from 1486 and Holy Roman Emperor from 1493 until his death, though he was never crowned by the Pope, as the journey to Rome was always too risky. He was the son of Frederick III, Holy Roman Emperor, and Eleanor of Portugal. He ruled jointly with his father for the last ten years of his father's reign, from c. 1483 to 1493. Maximilian expanded the influenceof the House of Habsburg through war and his marriage in 1477 to Mary of Burgundy, the heiress to the Duchy of Burgundy, though he also lost the Austrian territories in today's Switzerland to the Swiss Confederacy. Through marriage of his son Philip the Handsome to eventual queen Joanna of Castile in 1498, Maximilian helped to establish the Habsburg dynasty in Spain, which allowed his grandson Charles to hold the thrones of both Castile and Aragon. Charles' father Philip died in 1506, so Charles succeeded Maximilian as Holy Roman Emperor in 1519, and thus ruled both the Holy Roman Empire and the Spanish Empire simultaneously. Maximilian was born at Wiener Neustadt on 22 March 1459. His father, Frederick III, Holy Roman Emperor, named him for an obscure saint whom Frederick believed had once warned him of imminent peril in a dream. In his infancy, he and his parents were besieged in Vienna by Albert of Austria. One source relates that, during the siege's bleakest days, the young prince would wander about the castle garrison, begging the servants and men-at-arms for bits of bread. 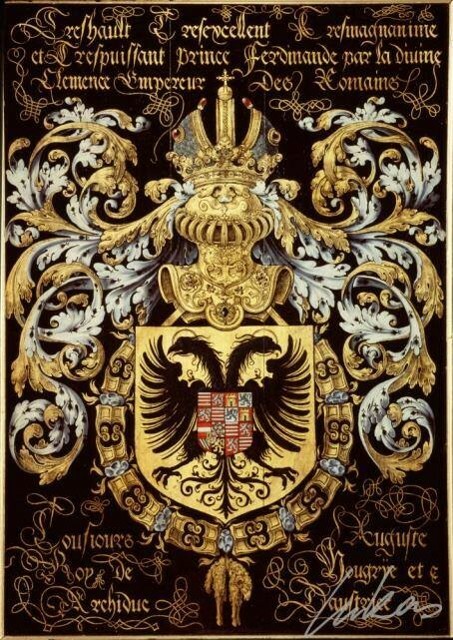 At the time, the Dukes of Burgundy, a cadet branch of the French royal family, with their sophisticated nobility and court culture, were the rulers of substantial territories on the eastern and northern boundaries of modern-day France. 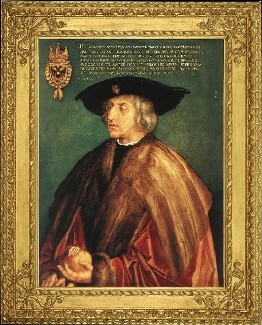 The reigning duke of Burgundy, Charles the Bold, was the chief political opponent of Maximilian's father Frederick III. Frederick was concerned about Burgundy's expansive tendencies on the western border of his Holy Roman Empire, and, to forestall military conflict, he attempted to secure the marriage of Charles's only daughter, Mary of Burgundy, to his son Maximilian. After the Siege of Neuss (1474–75), he was successful. The wedding between Maximilian and Mary took place on the evening of 16 August 1477. Maximilian's wife had inherited the large Burgundian domains in France and the Low Countries upon her father's death in the Battle of Nancy on 5 January 1477. Already before his coronation as the King of the Romans in 1486, Maximilian decided to secure this distant and extensive Burgundian inheritance to his family, the House of Habsburg, at all costs. The Duchy of Burgundy was also claimed by the French crown under Salic Law, with Louis XI, King of France vigorously contesting the Habsburg claim to the Burgundian inheritance by means of military force. Maximilian undertook the defence of his wife's dominions from an attack by Louis XI and defeated the French forces at Guinegate, the modern Enguinegatte, on 7 August 1479. The wedding contract between Maximilian and Mary stipulated that only the children of bride and groom had a right to inherit from each, not the surviving parent. Mary tried to bypass this rule with a promise to transfer territories as a gift in case of her death, but her plans were confounded. After Mary's death in a riding accident on 27 March 1482 near the Wijnendale Castle, Maximilian's aim was now to secure the inheritance to one of his and Mary's children, Philip the Handsome. Some of the Netherlander provinces were hostile to Maximilian, and they signed a treaty with Louis XI in 1482 that forced Maximilian to give up Franche-Comté and Artois to the French crown. They openly rebelled twice in the period 1482–1492, attempting to regain the autonomy they had enjoined under Mary. Flemish rebels managed to capture Philip and even Maximilian himself, but they were defeated when Frederick III intervened. Maximilian continued to govern Mary's remaining inheritance in the name of Philip the Handsome. After the regency ended, Maximilian and Charles VIII of France exchanged these two territories for Burgundy and Picardy in the Treaty of Senlis (1493). Thus a large part of the Netherlands (known as the Seventeen Provinces) stayed in the Habsburg patrimony. Maximilian was elected King of the Romans on 16 February 1486 in Frankfurt-am-Main at his father's initiative and crowned on 9 April 1486 in Aachen. He became emperor of the Holy Roman Empire upon the death of his father in 1493. Much of Austria was under Hungarian rule when he took power, as they had occupied the territory under the reign of Frederick. In 1490, Maximilian reconquered the territory and entered Vienna. As the Treaty of Senlis had resolved French differences with the Holy Roman Empire, King Louis XII of France had secure borders in the north and turned his attention to Italy, where he made claims for the Duchy of Milan. In 1499/1500 he conquered it and drove the Sforza regent Lodovico il Moro into exile. This brought him into a potential conflict with Maximilian, who on 16 March 1494 had married Bianca Maria Sforza, a daughter of Galeazzo Maria Sforza, duke of Milan. However, Maximilian was unable to hinder the French from taking over Milan. The prolonged Italian Wars resulted in Maximilian joining the Holy League to counter the French. In 1513, with Henry VIII of England, Maximilian won an important victory at the battle of the Spurs against the French, stopping their advance in northern France. His campaigns in Italy were not as successful, and his progress there was quickly checked. The situation in Italy was not the only problem Maximilian had at the time. The Swiss won a decisive victory against the Empire in the Battle of Dornach on 22 July 1499. Maximilian had no choice but to agree to a peace treaty signed on 22 September 1499 in Basel that granted the Swiss Confederacy independence from the Holy Roman Empire. In addition, the County of Tyrol and Duchy of Bavaria went to war in the late 15th century. Bavaria demanded money from Tyrol that had been loaned on the collateral of Tyrolean lands. In 1490, the two nations demanded that Maximilian I step in to mediate the dispute. In response, he assumed control of Tyrol and its debt. Because Tyrol had no law code at this time, the nobility freely expropriated money from the populace, which caused the royal palace in Innsbruck to fester with corruption. After taking control, Maximilian instituted immediate financial reform. In order to symbolize his new wealth and power, he built the Golden Roof, a canopy overlooking the town center of Innsbruck, from which to watch the festivities celebrating his assumption of rule over Tyrol. The canopy is made entirely from golden shingles. Gaining theoretical control of Tyrol for the Habsburgs was of strategic importance because it linked the Swiss Confederacy to the Habsburg-controlled Austrian lands, which facilitated some imperial geographic continuity. Within the Holy Roman Empire, Maximilian faced pressure from local rulers who believed that the King's continued wars with the French to increase the power of his own house were not in their best interests. There was also a consensus that deep reforms were needed to preserve the unity of the Empire. The reforms, which had been delayed for a long time, were launched in the 1495 Reichstag at Worms. A new organ was introduced, the Reichskammergericht, that was to be largely independent from the Emperor. A new tax was launched to finance it, the Gemeine Pfennig, though its collection was never fully successful. The local rulers wanted more independence from the Emperor and a strengthening of their own territorial rule. This led to Maximilian agreeing to establish an organ called the Reichsregiment, which would meet in Nuremberg and consist of the deputies of the Emperor, local rulers, commoners, and the prince-electors of the Holy Roman Empire. The new organ proved itself politically weak and its power returned to Maximilian in 1502. Due to the difficult external and internal situation he faced, Maximilian also felt it necessary to introduce reforms in the historic territories of the House of Habsburg in order to finance his army. Using Burgundian institutions as a model, he attempted to create a unified state. This was not very successful, but one of the lasting results was the creation of three different subdivisions of the Austrian lands: Lower Austria, Upper Austria, and Vorderösterreich. Maximilian was always troubled by financial shortcomings; his income never seemed to be enough to sustain his large-scale goals and policies. For this reason he was forced to take substantial credits from Upper German banker families, especially from the Baumgarten, Fugger and Welser families. Jörg Baumgarten even served as Maximilian's financial advisor. The Fuggers, who dominated the copper and silver mining business in Tyrol, provided a credit of almost 1 million gulden for the purpose of bribing the prince-electors to choose Maximilian's grandson Charles V as the new Emperor. At the end of Maximilian's rule, the Habsburgs' mountain of debt totalled six million gulden, corresponding to a decade's worth of tax revenues from their inherited lands. It took until the end of the 16th century to repay this debt. As part of the Treaty of Arras, Maximilian betrothed his three-year-old daughter Margaret to the Dauphin of France (later Charles VIII), son of his adversary Louis XI. Under the terms of Margaret's betrothal, she was sent to Louis to be brought up under his guardianship. Despite Louis's death in 1483, shortly after Margaret arrived in France, she remained at the French court. The Dauphin, now Charles VIII, was still a minor, and his regent until 1491 was his sister Anne. Dying shortly after signing the Treaty of Le Verger, Francis II, Duke of Brittany, left his realm to his daughter Anne. In her search of alliances to protect her domain from neighboring interests, she betrothed Maximilian I in 1490. About a year later, they married by proxy. However, Charles and his sister wanted her inheritance for France. So, when the former came of age in 1491, and taking advantage of Maximilian and his father's interest in the succession of their adversary Mathias Corvinus, King of Hungary, Charles repudiated his betrothal to Margaret, invaded Brittany, forced Anne of Brittany to repudiate her unconsummated marriage to Maximilian, and married Anne of Brittany himself. Margaret then remained in France as a hostage of sorts until 1493, when she was finally returned to her father with the signing of the Treaty of Senlis. In the same year, as the hostilities of the lengthy Italian Wars with France were in preparation, Maximilian contracted another marriage for himself, this time to Bianca Maria Sforza, daughter of Galeazzo Maria Sforza, Duke of Milan, with the intercession of his brother, Ludovico Sforza, then regent of the duchy after the former's death. Years later, in order to reduce the growing pressures on the Empire brought about by treaties between the rulers of France, Poland, Hungary, Bohemia, and Russia, as well as to secure Bohemia and Hungary for the Habsburgs, Maximilian met with the Jagiellonian kings Ladislaus II of Hungary and Bohemia and Sigismund I of Poland at the First Congress of Vienna in 1515. There they arranged for Maximilian's granddaughter Mary to marry Louis, the son of Ladislaus, and for Anne (the sister of Louis) to marry Maximilian's grandson Ferdinand (both grandchildren being the children of Philip the Handsome, Maximilian's son, and Joanna of Castile). The marriages arranged there brought Habsburg kingship over Hungary and Bohemia in 1526. Both Anne and Louis were adopted by Maximilian following the death of Ladislaus. Thus Maximilian through his own marriages and those of his descendants (attempted unsuccessfully and successfully alike) sought, as was current practice for dynastic states at the time, to extend his sphere of influence. The marriages he arranged for both of his children more successfully fulfilled the specific goal of thwarting French interests, and after the turn of the sixteenth century, his matchmaking focused on his grandchildren, for whom he looked away from France towards the east. These political marriages were summed up in the following Latin elegiac couplet: Bella gerant ali?, t? f?lix Austria n?be/ Nam quae Mars ali?s, dat tibi regna Venus, "Let others wage war, but thou, O happy Austria, marry; for those kingdoms which Mars gives to others, Venus gives to thee." Maximilian's policies in Italy had been unsuccessful, and after 1517 Venice reconquered the last pieces of their territory. Maximilian began to focus entirely on the question of his succession. His goal was to secure the throne for a member of his house and prevent Francis I of France from gaining the throne; the resulting "election campaign" was unprecedented due to the massive use of bribery. The Fugger family provided Maximilian a credit of one million gulden, which was used to bribe the prince-electors. At first, this policy seemed successful, and Maximilian managed to secure the votes from Mainz, Cologne, Brandenburg and Bohemia for his grandson Charles V. The death of Maximilian in 1519 seemed to put the succession at risk, but in a few months the election of Charles V was secured. Maximilian was a keen supporter of the arts and sciences, and he surrounded himself with scholars such as Joachim Vadian and Andreas Stoberl (Stiborius), promoting them to important court posts. Many of them were commissioned to assist him complete a series of projects, in different art forms, intended to glorify for posterity his life and deeds and those of his Habsburg ancestors. He referred to these projects as Gedechtnus ("memorial"), which included a series of stylised autobiographical works: the epic poems Theuerdank and Freydal, and the chivalric novel Weisskunig, both published in editions lavishly illustrated with woodcuts. In this vein, he commissioned a series of three monumental woodblock prints: The Triumphal Arch (1512–18, 192 woodcut panels, 295 cm wide and 357 cm high – approximately 9'8" by 11'8½"); and a Triumphal Procession (1516–18, 137 woodcut panels, 54 m long), which is led by a Large Triumphal Carriage (1522, 8 woodcut panels, 1½' high and 8' long), created by artists including Albrecht Dürer, Albrecht Altdorfer and Hans Burgkmair. Maximilian had a great passion for armour, not only as equipment for battle or tournaments, but as an art form. The style of armour that became popular during the second half of his reign featured elaborate fluting and metalworking, and became known as Maximilian armour. It emphasized the details in the shaping of the metal itself, rather than the etched or gilded designs popular in the Milanese style. Maximilian also gave a bizarre jousting helmet as a gift to King Henry VIII – the helmet's visor featured a human face, with eyes, nose and a grinning mouth, and was modelled after the appearance of Maximilian himself. It also sported a pair of curled ram's horns, brass spectacles, and even etched beard stubble. Maximilian had appointed his daughter Margaret as both Regent of the Netherlands and the guardian and educator of his grandsons Charles and Ferdinand (their father, Philip, having predeceased Maximilian), and she fulfilled this task well. Through wars and marriages he extended the Habsburg influence in every direction: to the Netherlands, Spain, Bohemia, Hungary, Poland, and Italy. This influence would last for centuries and shape much of European history. The Hapsburg Empire would survive as the Austria-Hungary Empire until it was dissolved November 3, 1918-299 years 11 months and 9 days after the demise of Maximilian. Among his descendants are King Felipe VI of Spain and Queen Elizabeth II of the United Kingdom. Maximilian I was a member of the Order of the Garter, nominated by King Henry VII of England in 1489. His Garter stall plate survives in St George's Chapel, Windsor Castle. Maximilian I, by the grace of God elected Holy Roman Emperor, forever August, King of Germany, of Hungary, Dalmatia, Croatia, etc. 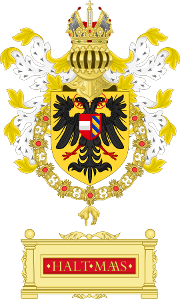 Archduke of Austria, Duke of Burgundy, Brabant, Lorraine, Styria, Carinthia, Carniola, Limburg, Luxembourg, Gelderland, Landgrave of Alsace, Prince of Swabia, Count Palatine of Burgundy, Princely Count of Habsburg, Hainaut, Flanders, Tyrol, Gorizia, Artois, Holland, Seeland, Ferrette, Kyburg, Namur, Zutphen, Margrave of the Holy Roman Empire, the Enns, Burgau, Lord of Frisia, the Wendish March, Pordenone, Salins, Mechelen, etc. etc.